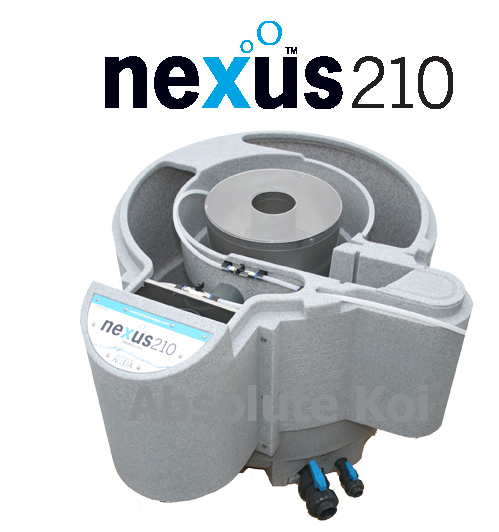 The New Nexus Eazy 210 represent's an evolutionary leap forward in the development of the world's most successful koi filter. Improvements to the Nexus Eazy, overflows and bypass systems, along with simplified cleaning process will make the Nexus Eazy 210 the must have filter for 2010. The Nexus Eazy 210 has been redesigned from the bottom up to provide improved mechanical filtration and ease of cleaning. The clear lid that is now incorporated on to the Nexus Eazy 210 which will insure the correct ammount of k1 media is always maintained within the mechanical stage. The only possible compromise that owners of the original Nexus Eazy 200 faced was that the Nexus Eazy 200 could not be left without cleaning for extended periods of time. The good news is that the Nexus Eazy 210 now incorporates a gravity bypass or pump fed overflow depending on how the Nexus Eazy 210 is going to be used. This will stop any possibilty of the middle chamber overflowing and bypass the water in to the exit chamber returning back to the pond. This now means that the Nexus Eazy 210 user can enjoy their holiday in certain knowledge that all is well with their pond at home. The Nexus Eazy 210 is available from 4th January 2010, why not order yours now to be one of the first in line for this amazing new filter.